The picture below was taken in Memphis, Tennessee, in June of 1984. 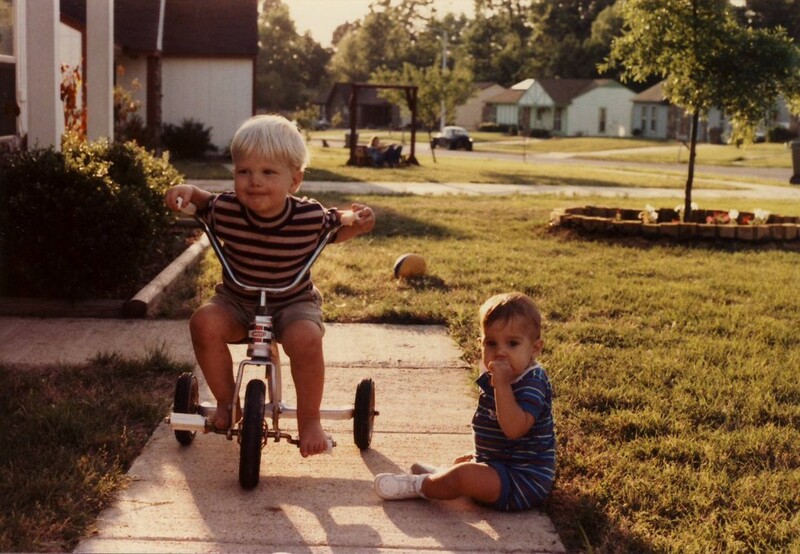 The boy on the tricycle is our son, Daniel, now 29. The little tot on the walkway is our son, Joel, now 28. Shannan's dad and mom planted the oak in the background to commemorate Daniel's birth and planted one behind the house for Joel. Two weeks ago I was in Memphis, and I decided to take a trip down memory lane to see the old house . . . and to check in on the trees. Oh what a difference a day makes! Well . . . 10,585 days to be exact. When you look at people today, will you see saplings or oaks? Boys or men? Christians "believe the best." They see past present weakness because they know the One who can transform them into strengths. When they had finished breakfast, Jesus said to Simon Peter, "Simon, son of John, do you love me more than these?" He said to him, "Yes, Lord; you know that I love you." He said to him, "Feed my lambs." He said to him a second time, "Simon, son of John, do you love me?" He said to him, "Yes, Lord; you know that I love you." He said to him, "Tend my sheep." He said to him the third time, "Simon, son of John, do you love me?" Peter was grieved because he said to him the third time, "Do you love me?" and he said to him, "Lord, you know everything; you know that I love you." Jesus said to him, "Feed my sheep. (John 21:15-17). I love that passage of Scripture. Jesus knew Simon Peter's weakness, but he also knew what Simon Peter would become through His strength. I need to remember that. Too often I see boys, when God wants me to see men. I see saplings when God wants me to see oaks. through Christ who gives them strength.